â&#128;¨â&#128;¨The metaphoric progress of a rolling snowball is the starting-point of Danish artist Isis Meander’s transformative, new photographic oeuvre, in which she has been greatly inspired by the Icelandic nature and has herein been drawn towards the mystifying unknown. The works presented in this exhibition enclose impressions that nature independently has created in the surroundings of Akureyri, but at the same time indicate how we as analytic perceptive subjects often project own conceptions into these surroundings. Isis Meander is inspired by Sigmund Freud&#39;s definition of The Uncanny from his essay The Uncanny (1919). â&#128;¨Isis Meander is depicting surroundings in which there is a disharmony and where something seems deviant which at the same time is defining her general artistic praxis. â&#128;¨â&#128;¨The work Uncertain Times presented at Deiglan is a subtle abstract recreation of unpredictable phenomenons happening in nature. The unpredictable and undeterminable is a feeling much linked to this work. The zoetrope in which the images are installed invites the viewer to start the photographic animation, which ends abrupt and disturbingly (for the eye and mind). â&#128;¨In the photographic series Impending Memories it is obvious that the images play with ideas on psychologic tensions. She is interested in showing the small signs of lurking danger which are everyday scenes transformed into interpretation of a paranoid view of surroundings containing elements of nature.â&#128;¨â&#128;¨â&#128;¨â&#128;¨Menace as a driving force is evident in these photographic works and connotations to aesthetic, psychological or philosophical reflections seems obvious and considerable. The fascination of unknown possibilities and unspecified lurking has inspired artists for decades. To a great extent Isis Meander does not differ. Her work encompasses the challenges, which lies in the apprehension of the unknown.â&#128;¨â&#128;¨These matters, which her new series of work are concentrated on, are also deeply motivated by aspects of time and subject matter common to the metaphoric imagery of dystopic, imaginative landscapes. Isis Meander’s practice is focussing on ideas of recollection, experience, gaze and relations; which has been primarily communicated through photographic media. These subjects play a central role in her concept of space and are often a "direct" response to what is an impression, understanding or experience of my immediate surroundings. Isis Meander is educated from Malmö Art Academy (MFA) in 2008 and is currently based in Copenhagen, Denmark. Guest artist at Gil Society, Akureyri. Nes listamiðstöð á Skagaströnd auglýsir eftir umsóknum frá íslenskum listamönnum. Í boði er 50 þús. kr. dvalarstyrkur fyrir hvern listamann á vorönn 2013, mars, apríl og maí. Gist er í íbúðum þar sem hver listamaður hefur sitt herbergi en deilir sameiginlegu rými með 2-3 öðrum listamönnum, flestum erlendum. Í Nes listamiðstöð eru allt að 12 listamenn í hverjum mánuði og það býður upp á einstaka möguleika á tengslamyndun, tækifærum til samstarfs, umræðum og listrænni þróun. Á meðan styrkhafar dvelja í listamiðstöðinni þurfa þeir að koma með tillögu um samfélagsverkefni á staðnum og vinna að því. Allar nánari upplýsingar eru á vefsíðunni: http://neslist.is . Einnig er hægt að hafa samband við Melody á netfanginu nes@neslist.is . Umsóknarfresti lýkur 15. janúar 2013. Menningarráð Norðurlands vestra styrkir Nes listamiðstöð til að bjóða íslenskum listamönnum dvalarstyrk gegn samfélagslegu framlagi. Hannah og Luuk eru fjölhæfir listamenn frá Bandaríkjunum. Þau skapa tónlist, teikna og mála, útbúa prentverk og eru hæfileikarík í eldamennsku. Á sýningunni Huldufólk eru þau með teikningar og málverk sem þau hafa gert í dvöl sinni í Listhúsi. Þau sækja sér innblástur í hugmyndir um huldufólk og í raunverulegt íslenskt landslag og umhverfi . Dularfullt andrúmsloft er gert náttúrulegt. Samkvæmt skipulagsskrá sjóðsins nr. 9321 er markmið hans ,,að styrkja og hvetja unga og efnilega myndlistarmenn til náms” en stofnfé sjóðsins er arfur samkvæmt erfðaskrá Guðmundu Andrésdóttur listmálara sem lést árið 2002. Ráðstöfunarfé sjóðsins eru raunvextir af höfuðstól og verður í ár ráðstafað 3.8 milljónum króna. Stjórn sjóðsins ákveður hversu margir styrkir verða veittir. Stefnt er að úthlutun eigi síðar en 27. desember næstkomandi. Umsóknarfrestur er til og með 17. desember 2012. Umsóknir merktar styrktarsjóðnum skulu sendar Listasafni Íslands, Laufásvegi 12, 101 Reykjavík. Föstudaginn 7. desember kl. 21.00 opnar Daníel Starrason ljósmyndasýningu í Populus tremula og á sama tíma hefjast þar tónleikar fjögurra hljómsveita. Það eru Naught, Sejl klubben, Brák og Völva. 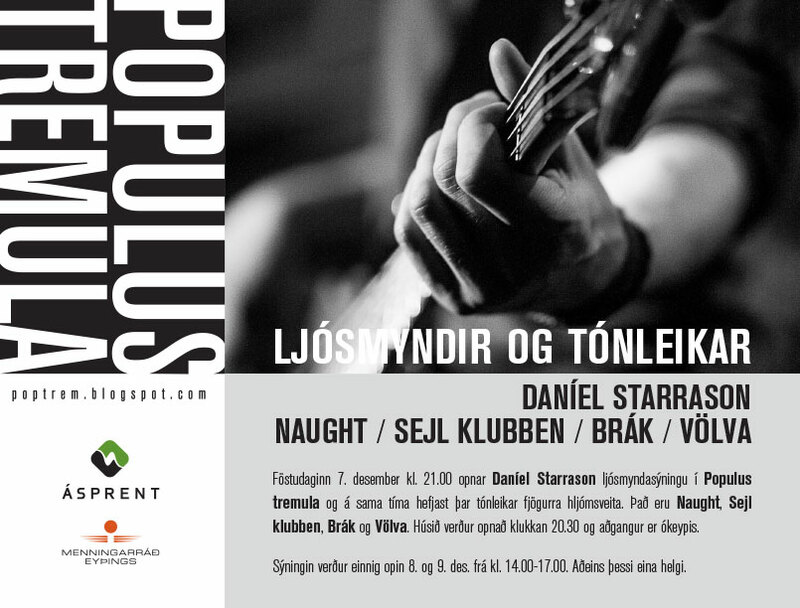 Húsið verður opnað klukkan 20.30 og aðgangur er ókeypis. Sýningin verður einnig opin 8. og 9. des. frá kl. 14.00-17.00. Aðeins þessi eina helgi.